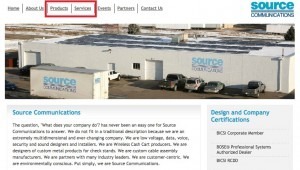 Source Communications started as a cable assembly and wiring company in 1987. Since then, they expanded into designing, installing and maintaining security systems and designing and manufacturing custom retail checkout product lines. Straddling so many capabilities made it challenging for Source Communications to effectively message their value proposition to all their intended audiences. 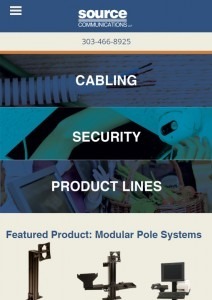 Their website had to convey their core business offerings and let visitors know where to find what they needed quickly. 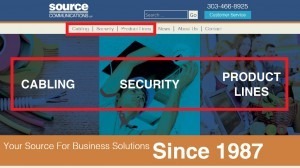 The new website design made it easier for Source Communications to post client updates, announcements, and manage social media. FiG then rewrote site content for clarity and flow. We added keyword analysis, and goal and event tracking which allowed us to analyze and improve user interactions. The combined efforts resulted in increased traffic, page views, session duration, and sales conversions from the previous year. The most notable achievement was our ability to lengthen the time spent on our client’s website from 47 seconds to 2:26 minutes. This resulted in a 100% sales conversion through their contact submission form--outstanding for any digital strategy! View Source Communications’ new site here and contact us to learn more about how we can improve your digital marketing strategy.